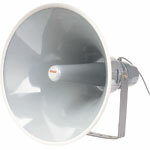 8 ohm, 15 watt, PVC weatherproof horn. Suitable for security, PA, extension speaker, etc. 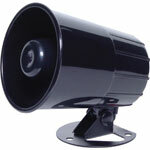 Includes swivel mounting bracket. Fits S 5462 siren box. 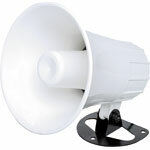 Ideal for PA, CB extension speakers, boats and alarms etc. White PVC construction. Swivel bracket included. Flare dimensions: 135mm. 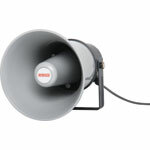 The all plastic construction makes this horn speaker suitable for sheltered outdoor use. 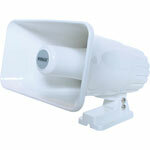 It may be used for both PA and siren/alarm applications. The vibration-proof construction allows it to be mounted on vehicles. 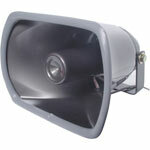 Excellent low cost re-entrant horn speaker All aluminium construction. 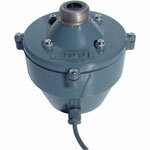 Suitable for outdoor applications. 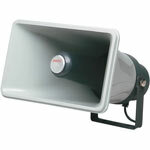 Suitable for PA systems, CB extension speakers, alarms etc.